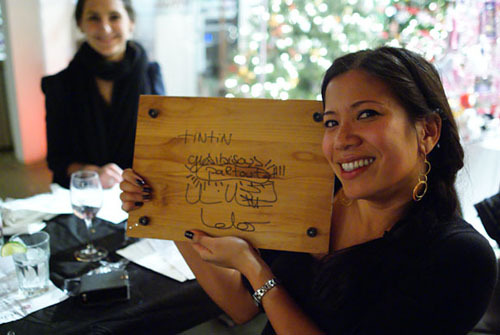 December 22 marked the end of the third iteration of Chef Ludovic Lefebvre's "guerilla style pop-up restaurant" concept LudoBites. 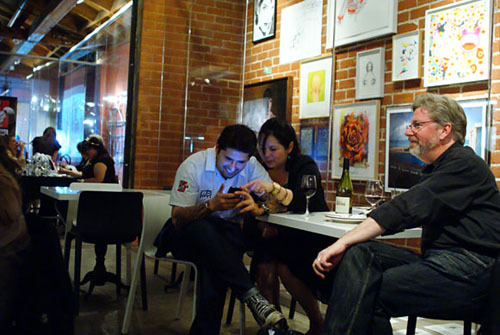 This latest series debuted on December 2, and over the past month, despite some drama in the kitchen, has proven to be another smashing success, further entrenching Ludo in the hearts and minds of LA's culinary cognoscenti. It was almost a foregone conclusion that I'd be attending LudoBites' final night--the only question would be: with whom? It turns out that the Two Hungry Pandas, Wesley and Evelina, had secured a reservation early on, so I ended up joining their party of eight, which also included Danny of Kung Food Panda, Holly of The Michelin Project, Twitterer extraordinaire Remil, Ryan of Epicuryan (formerly Only Eat What Feeds Your Soul), and Will of FoodDigger. But since this was LudoBites after all, a restaurant that, according to Mr. Gold, sometimes seems as if it is run for the sole benefit of food bloggers, we were hardly alone. Here's the roster of attendance: Arnold of Inuyaki (who came all the way from NorCal), Caroline of Caroline on Crack, Esther of e*star LA, Fiona of Gourmet Pigs, Jo of My Last Bite, Lindsay and Sam from LAist, Noelle of Drink 'n' Dive, Patricia of Life With a Whisk, and Twitterer Tin. 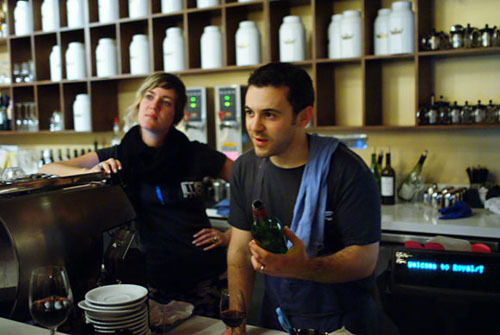 Also present were Jill Donenfeld, founder of private cheffing company The Dish's Dish; Rachael Narins of private supper club Chicks with Knives; and Brian, Pleasure Palate Assistant Organizer and aspiring underground dinner impresario. 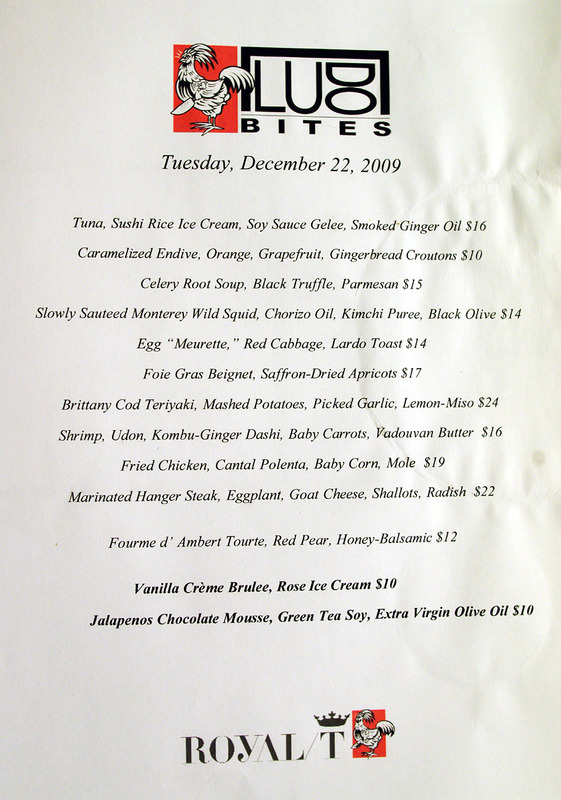 Above, we see the final night's menu; click for a larger version. 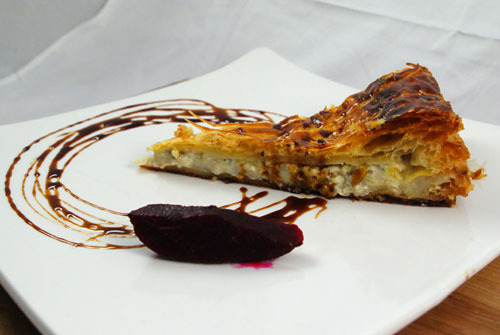 Note that only one item--the tourte--remained completely unchanged from the opening carte. We ended up ordering multiples of every item, save for the cod (which the kitchen had run out of). Though this incarnation of LudoBites did offer a very reasonable wine list, we ended up supplying our own tipple (we were not charged corkage). Specifically, FoodDigger's Will did most of the heavy lifting, graciously providing four bottles, including this vintage 1975 Château Montrose, a dry, austere, slightly herbal, currant-tinged Bordeaux with a hint of funk on the finish. Surprisingly, it actually went quite well with the lighter dishes that we had to start. To kick off the dinner, a round of the Montrose to all. Cheers! 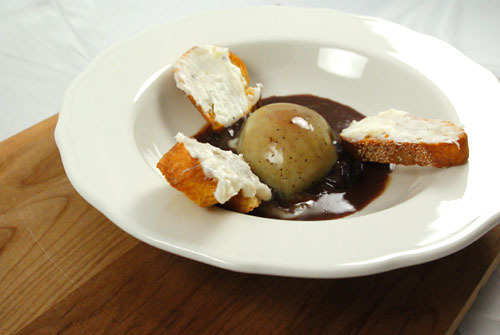 We began with one of Ludo's most "classic" creations, dating back to his tumultuous tenure at Bastide. It's a dish that I'd had on my very first, and my most recent, LudoBites visit. The one tonight, fortunately, was arguably the most successful version. The dish starts with four generous slabs of cardinal-tinted maguro. Taken alone, the tuna was tasty enough, but really, it functioned as a base on which the other ingredients could really sing. As before, the "rice cream" was absolutely key, integrating the other factors at play--I especially appreciated the use of crispy onion and sprouts this time around--while conveying the essence of sushi rice. Eating everything together, you get a interesting sensation of seemingly disparate textures, tastes, and temperatures, all different, yet somehow working together in one unified whole. Here we see Ludo doing what he does best, besides cook: laying on the charm to the ladies (note the use of jazz hands)! Next up were some caramelized endives, showing plenty of their characteristic bitterness. 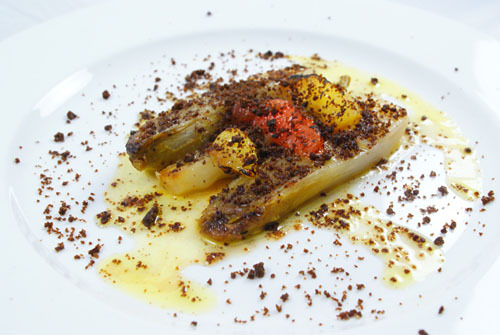 The citrus provided some countervailing sweetness and acidity, resulting in a sort of bittersweet character, but I would've liked more from the accoutrements in balancing out the endive. 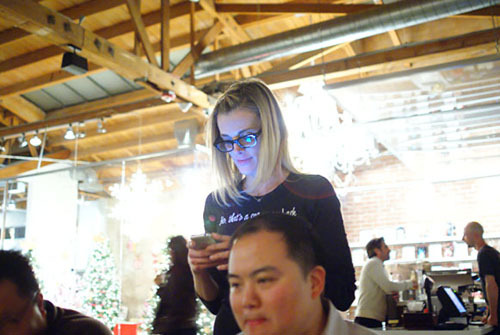 Krissy Lefebvre, seen here directing service in the dining room. 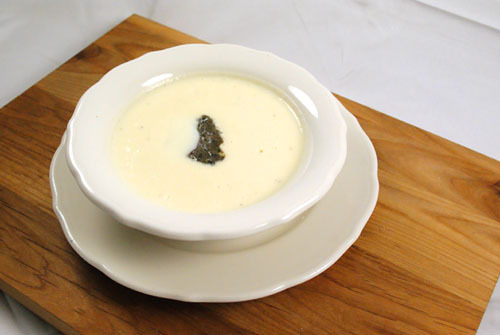 Here was a hearty celeriac soup, with Parmesan cheese and black truffle. The base of this dish was strictly celery root, but the interplay between the rich Parmesan and earthy truffle clearly took center stage here, instantly grabbing my attention. The notes of celery flavor from the soup acted as a lightening element, becoming strongly apparent only on the finish. While we were photographing the soup, a lady in red walked in and got in on some of the soft box action. As we can see in the second photo, she was positively astonished when she found out that we were all bloggers, and that we were all Asian. 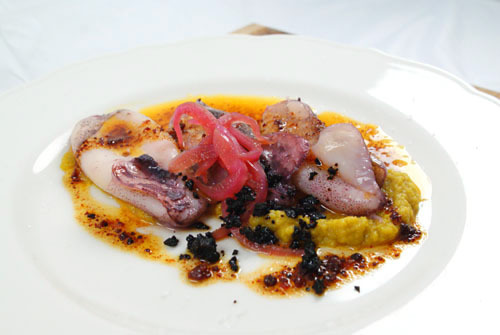 One of the constants on the LudoBites 3.0 menu has been this beautifully-cooked squid, delightfully chewy and teeming with the unbridled briny quintessence of the cephalopod. Though tasty by itself, the squid was made even better by the spicy chorizo and the piquant purée of kimchi in particular. I loved the light, bright, acidic flavors here--clearly one of the highlights of the meal. 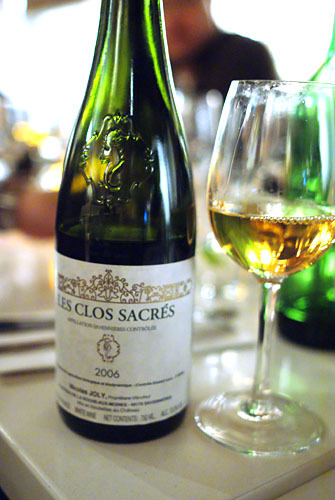 Will's next wine for us was the 2006 Nicolas Joly Savennières Les Clos Sacrés, from France's Loire Valley. Made from Chenin Blanc, it was a lovely wine, showing loads of sugary stone fruit and honey on the palate, with just enough spice and acid to make it interesting. 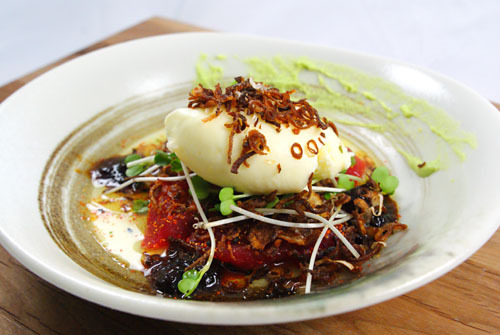 A table favorite, this was Ludo's version of the classic French country dish Oeufs en Meurette, or eggs in red wine. Naturally, the key here was the wonderfully poached egg. Still runny, it added a great creaminess that deftly complemented the acidic tang of the red cabbage. The toast, meanwhile, adding a palpable weight to the dish. Very good, and even better than last time's. Ahh yes, Ludo's infamous foie gras beignets. As before, the beignets themselves were the pinnacle of luxuriousness, sweet at first, but imbued with the decadence of a full two ounces of fatty liver. 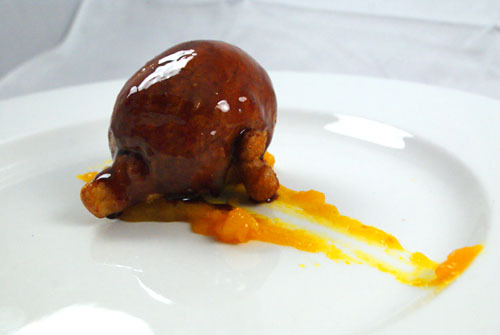 However, instead of the céleri rémoulade he used before, this time Ludo paired the foie with an amalgam of apricot and saffron. This, I felt, resulted in a dish that was overly sweet for me; I think that it would've been more effective had the astringency of saffron been more pronounced. 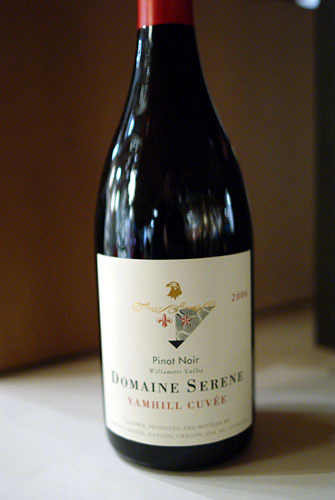 For our third wine, Will chose the 2006 Domaine Serene Pinot Noir Yamhill Cuvée, which comes to us from Oregon's Willamette Valley. Rife with dark berry and a bit of licorice, the wine also had a great minerality; tannins, meanwhile, were very soft. Here, Krissy enjoys some of the pinot with us. Cheers! On my first visit, the veal and udon dish was one of the standouts. 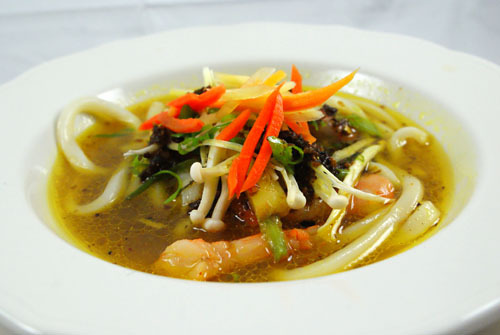 Unfortunately, the version tonight wasn't quite as successful, as I felt that the broth was overly saccharine, resulting in a sort of monotonous sweetness that hid the individual characteristics of each ingredient. I think that the dish would've been more balanced had the vadouvan been more apparent. 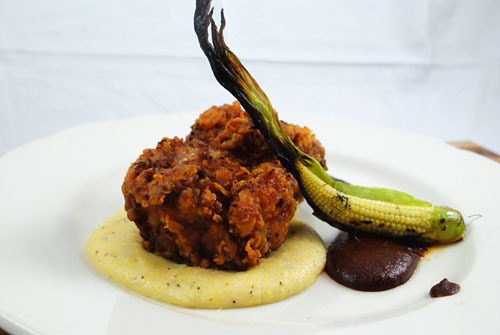 And now, we come to the most widely-anticipated item of the night: the LFC, Ludo's Fried Chicken. As I've stated before, this is definitely some of the best fried chicken I've ever had--with tender, juicy flesh, imbued with a profound depth of flavor, all encased in a delightfully crispy, savory skin. The chicken stood on its own, but surprisingly, the application of the polenta took the bird to an even higher level with its subtle, tempering cheesiness. I also loved the baby corn, still in husk, while the mole provided a lingering sugariness to the whole dish. Superb. Will liked the chicken so much that Krissy brought out an extra plate for him (which he subsequently shared)--just look at that mischievous grin! 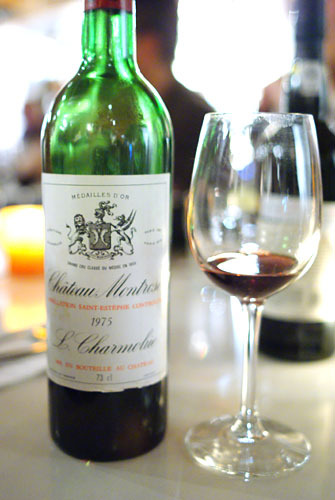 We'd run out of dry wine at this point, but it turns out that Will just happened to have another bottle of the '75 Montrose in his car, which he generously opened for us--steak and Bordeaux, a classic pairing to be sure. Ludo scored big with his hanger steak the first time around, so I was looking forward to this. Though the steak wasn't overwhelmingly tender, it did have a pleasing, "toothsome" texture and was immensely flavorful, absolutely steeped in "beefy" savor--I could've easily eaten it alone. 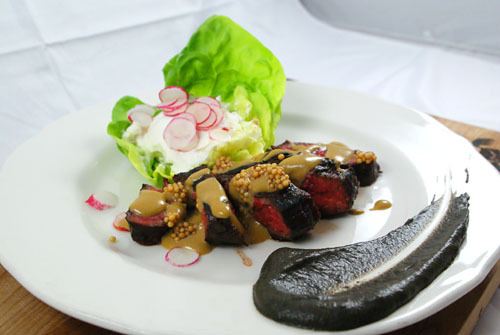 What really made this special, though, was the use of goat cheese, which added a fantastic, luscious, creamy, moderating flair to the beef that was utterly heavenly. Peter and Jo, with Esther and Sam. Yes people, that was none other than Fred Savage in the kitchen! Savage actually had little professional cooking experience prior to LudoBites, and was staging here simply for his love of the art. From what I've heard, he was super eager to learn, willing to do whatever it takes. 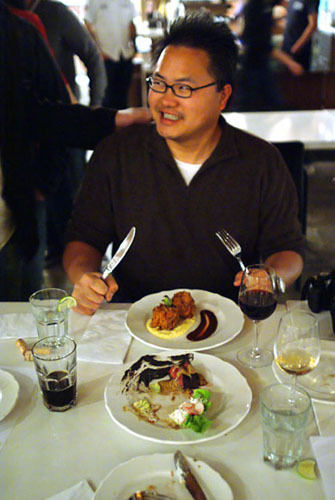 Another notable chef in the kitchen was Austin Szu (and here), of Austio's Catering and the blog Living to Eat (also Yelp). 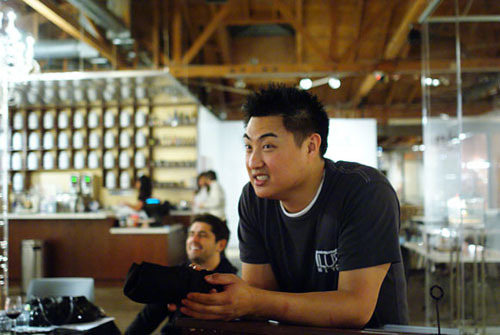 A graduate of CSCA's Le Cordon Bleu program, Szu previously held various pastry chef positions at restaurants across the Southland, including the now-shuttered Mirabeau in Dana Point, Zov’s Bistro in Tustin, and Scott’s Seafood in Costa Mesa. 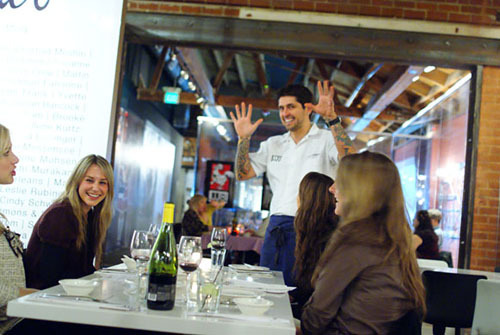 Recently, the Chef also staged at such LA mainstays as BLT Steak, Craft, and Grace. Remil kindly contributed a bottle of Port to go with our desserts. 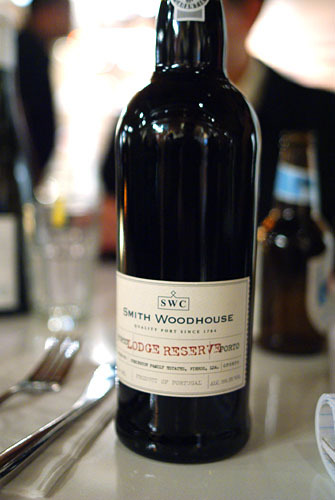 The Smith Woodhouse Porto Lodge Reserve was pleasantly light in body, but still imbued with those signature Port flavors of dark berry, cassis, and plum. Quite nice. This is one item that, as far as I know, has always been on the menu here at LudoBites 3.0. And with good reason: the tart did a great job in conveying the cheese's characteristic savoriness, moderated by layers of delectable pastry, while the pear provided a fitting, saccharine counterpoint. 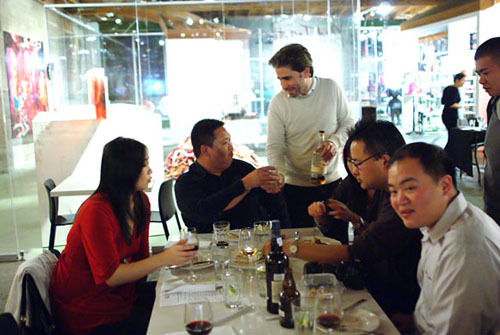 Brian brought a bottle of 23-year old Ron Zacapa rum, which he gleefully shared with everybody. It was certainly one of the best rums I've had, with delicious notes of vanilla and molasses over a smooth, slightly spicy body. 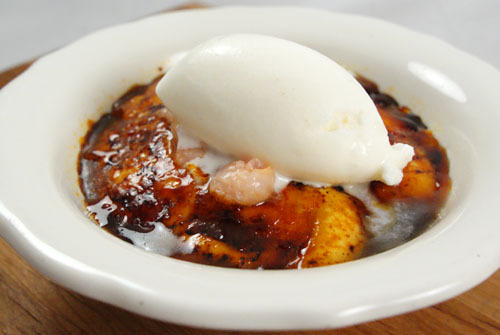 This was crème brûlée, but at the same time, so much more. The custard was astoundingly complex, a pastiche of various sweet and sour flavors (someone mentioned that there was even lychee inside) that somehow managed to meld together into a singular, coherent flavor profile. Very good. Holly gingerly spoons the crème brûlée. We closed with a seemingly harebrained dessert. Chocolate and jalapeños, with olive oil? Somehow, it manages to work. 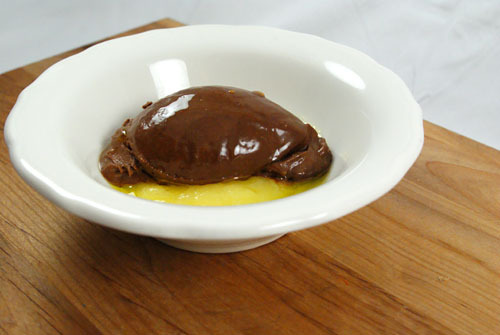 At first, it tasted like a chocolate mousse, but then the weight of the olive oil made itself known, adding a perceptible gravity to the dessert--interesting. The heat from the peppers continued to build, leaving a linger, piquant sensation in my mouth. And with that, the food was done. Here, we see Krissy tweeting a sigh of relief. Jo shows off her favorite page in Ludo's cookbook, Crave: The Feast of the Five Senses. Veteran LudoBites server Daria looks adorable in her cosplay maid uniform. Krissy enjoys a much-deserved glass of Cremant de Bourgogne Rosé from her after service meal. Daria, still cute in street clothes, with Patricia and Tin Tin. Wes and Will get in on the action. LudoBites cutting boards are now available. Annoyingly, I forgot to take mine home. The requisite photos of the dynamic duo. Once again, we come to the end of another rousing round of LudoBites. The question thus becomes, as always: what's next? Ludo has said that he'd love to bring LudoBites to different locales across the country, or perhaps even across the world. Whether that happens or not remains to be seen, but the Chef has stated his intention to "pop-up" again in the first quarter of next year. And yes, finding a permanent home is still the end goal. So with that, I'll see you in 2010! Seriously, your food photos are my favorite! Happy New Year Kevin! 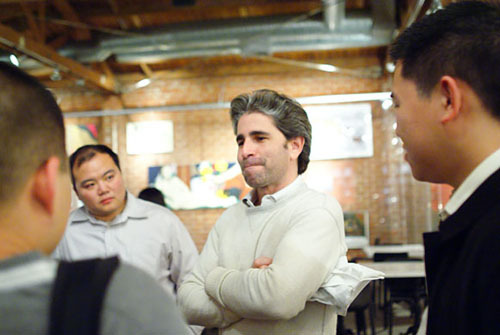 nice recap of another enjoyable Ludobites meal. Happy New Year. Note to self: get reservations for LudoBites 4.0 as soon as they're available! 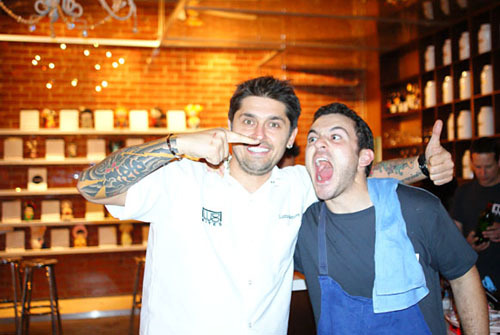 He definitely appears to be the most inventive and imaginative chef in LA today. 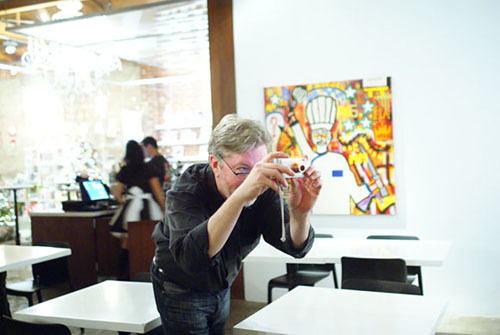 I get nervous enough bringing a camera to a restaurant (but I do it anyway). I get even more nervous bringing a SLR. You guys just straight up bust out a light box. So crazy. Mind telling me what brand/type? How many lights around the box? You make it look like a red carpet event!!! Sadly, on my bday visit I did not try the egg dish and I wish I would have. Also, I was wondering if the amount of foie held up from the preview to an actual visit. And the lady in red needs to get out more often!!!! Tremendous night with you guys! 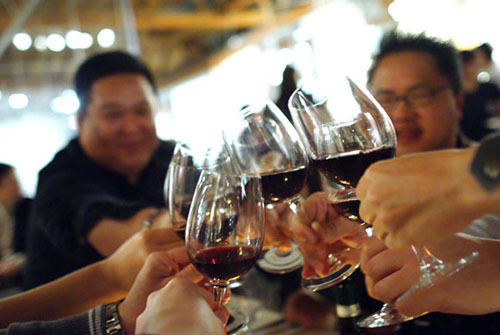 I'm glad everyone enjoyed the wines. A bottle is always best when shared. By the way, although I am a pig, I must give credit where it is due. Krissy was kind enough to send out that plate of chicken on the house. She saw how much I loved it and was thoughtful enough to run into to kitchen to squeeze out one more order for me. I love how she treats everyone like family. I hope the duo remains intact in future iterations of LudoBites! Really enjoyed the interlay between the food shots and the candid shots from the diners, Ludo, Krissy, and others. Good times! 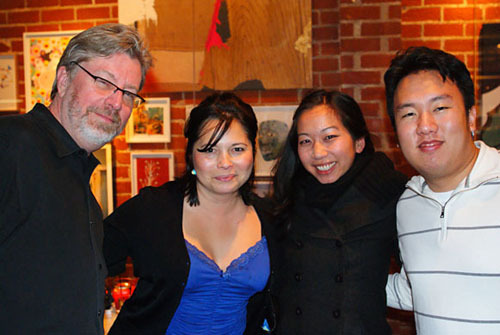 Let's hope for some more great meals with awesome company in 2010. Happy New Year! Jo: I was really contemplating posting that one of you and Krissy kissing! Austin: Got it. Also, I just added a blurb about your stages this year. Brian: Nice to (finally) meet you Brian! sygyzy: Just to clarify, the light box was provided by Krissy, based off of a suggestion I had from the previous LudoBites. I wouldn't have nearly enough gall to bring my own--I'm not that daft! I don't know what brand it was, but it did have two lights outside of the cloth, one on each side. Will: Ahh, thanks for the clarification. I've made the correction. Thanks again for the wine, and for breaking me off some of that LFC! Danny: Yeah, I felt it might be fun to mix things up a bit. 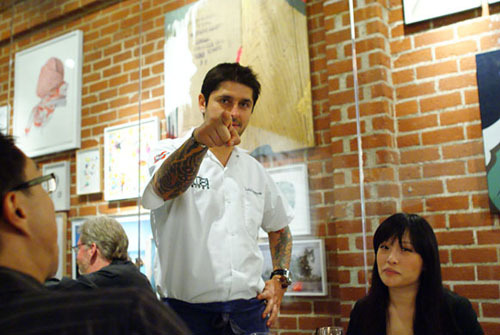 The food's been written about a lot, so I thought that people would be more interested in the "people" side of things. Happy new year! yeah... I noticed... I was like "that wasn't there before..."
Austin, you should update your page on ChefDb with your new experience.